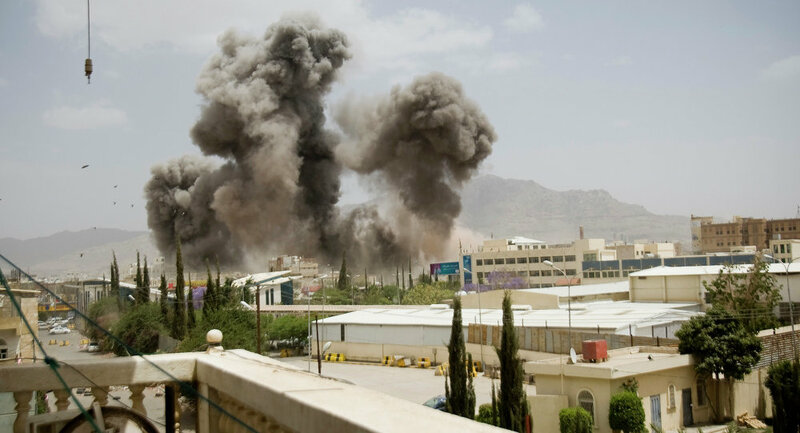 JNN 21 Apr 2015 Sanaa : The Ansarullah fighters along with army units continued to make gains in their fight against the Saudi-backed al-Qaeda Takfiri group on Sunday, flushing out the terrorists from a town in Abyan province. According to reports, the popular forces made major advances in South-central Yemen and drove out al-Qaeda from al-Wadhi area in Ahwar town. Also on Saturday, the Ansarullah forces advanced towards Kowfal camp in Ma’rib province, after killing scores of the al-Qaeda terrorists. Earlier, the Yemeni troops made major gains in Sarvah district of Ma’rib province, and killed Bin Aboud, the notorious al-Qaeda leader and more than 25 other terrorists. The Ansarullah fighters and the army troops have made major advances in their fight against the terrorists across Yemen. The clashes between the Ansarullah fighters and the Saudi-backed al-Qaeda terrorists as well as the pro-Hadi militias continue in the Southern parts of the country as Saudi Arabia has been striking Yemen for 25 days now to restore power to fugitive president Mansour Hadi, a close ally of Riyadh. The Saudi-led aggression has so far killed at least 2,655 Yemenis, including hundreds of women and children. New evidence shows that Saudi Arabia has used chemical weapons in its latest round of attacks on the Northern Province of Sa’ada and the capital Sana’a, a Yemeni source said. According to the source who asked to remain anonymous, the Saudi warplanes used toxic gas in their Saturday’s strikes on markets and civilian areas in Sa’ada, leaving scores of people dead and injured. Yemen’s Red Crescent Society confirmed that tens of children have died as a result of inhaling the poisonous gases of the Saudi bombs thrown on the people in Sana’a. “We will display a video on the death of tens of children who died after inhaling poisonous gases,” an official of Yemen’s Red Crescent Society, Abdollah Maboud Al-Shokri, told FNA on Sunday. He noted that the bomb explosions in the Saudi airstrikes not only destroy a large number of homes, but also create a thick cloud of poisonous and fatal gases. Yemeni officials had already warned that the bombs that the Saudi regime has used in Sana’a were different from those used in other parts of Yemen. They said that the bombs were of the very rare and dangerous type that resulted in the suffocation of the residents of the affected regions. On Friday, eyewitnesses said that Saudi Arabia has used internationally banned weapons in its aerial bombardment on an area near Sana’a. According to aid workers and Yemeni locals, the Saudi warplanes used prohibited arms in their airstrikes on Fag Atta area in Southern Sana’a on Friday. Saudi Arabia has been striking Yemen for 25 days now to restore power to fugitive president Mansour Hadi, a close ally of Riyadh. The Saudi-led aggression has so far killed at least 2,645 Yemenis, including hundreds of women and children. Contradictory to Riyadh’s claims that it is bombing the positions of the Ansarullah fighters, Saudi warplanes are flattening residential areas and civilian infrastructures. This entry was posted in Middle East and tagged chemical weapons, Saudi AirStrikes, Yemeni Civilians. Bookmark the permalink.